Optical solitons are special wave packages that propagate without changing their shape. In optical communications, solitons can be used for generating frequency combs with various spectral lines, which allow to realize particularly efficient and compact high-capacity optical communication systems. This was demonstrated recently by researchers from KIT's Institute of Photonics and Quantum Electronics (IPQ) and Institute of Microstructure Technology (IMT) together with researchers from EPFL's Laboratory of Photonics and Quantum Measurements (LPQM). As reported in Nature, the researchers used silicon nitride microresonators that can easily be integrated into compact communication systems. Within these resonators, solitons circulate continuously, thus generating broadband optical frequency combs. Such frequency combs, for which John Hall and Theodor W. Hänsch were awarded the Nobel Prize in Physics in 2005, consist of a multitude of spectral lines, which are aligned on a regular equidistant grid. 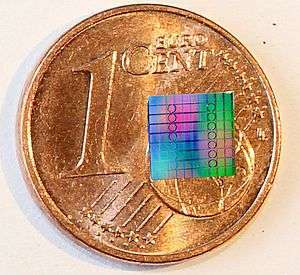 Traditionally, frequency combs serve as high-precision optical references for measurement of frequencies. So-called Kerr frequency combs feature large optical bandwidths along with rather large line spacings, and are particularly well suited for data transmission. Each individual spectral line can be used for transmitting a separate data channel. In their experiments, the researchers from Karlsruhe and Lausanne used two interleaved frequency combs to transmit data on 179 individual optical carriers, which completely cover the optical telecommunication C and L bands and allow a transmission of data in a rate of 55 terabits per second over a distance of 75 kilometers. "This is equivalent to more than five billion phone calls or more than two million HD TV channels. It is the highest data rate ever reached using a frequency comb source in chip format," explains Christian Koos, professor at KIT's IPQ and IMT and recipient of a Starting Independent Researcher Grant of the European Research Council (ERC) for his research on optical frequency combs. The components have the potential to reduce the energy consumption of the light source in communication systems drastically. The basis of the researchers' work are low-loss optical silicon nitride microresonators. In these, the soliton state described was for the first time generated by the working group around Professor Tobias Kippenberg at EPFL in 2014. Explaining the advantages of the approach, Professor Kippenberg says, "Our soliton comb sources are ideally suited for data transmission and can be produced in large quantities at low costs on compact microchips." The soliton forms through so-called nonlinear optical processes occurring due to the high intensity of the light field in the microresonator. 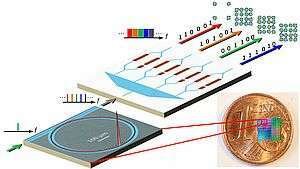 The microresonator is only pumped through a continuous-wave laser from which, by means of the soliton, hundreds of new equidistant laser lines are generated. The comb sources are currently being brought to application by a spin-off of EPFL. The work published in Nature shows that microresonator soliton frequency comb sources can considerably increase the performance of wavelength division multiplexing (WDM) techniques in optical communications. WDM allows to transmit ultra-high data rates by using a multitude of independent data channels on a single optical waveguide. To this end, the information is encoded on laser light of different wavelengths. For coherent communications, microresonator soliton frequency comb sources can be used not only at the transmitter, but also at the receiver side of WDM systems. The comb sources dramatically increase scalability of the respective systems and enable highly parallel coherent data transmission with light. According to Christian Koos, this is an important step towards highly efficient chip-scale transceivers for future petabit networks. High bandwidth multi channel comms between multi-blade servers without spending your cost and heat budgets on fast fabric switches will indeed be a big step forward. Especially when we all want to talk to AI's in the cloud at the same time with low latency in the near future.